The organisers of the first-ever Lincoln Flume have revealed that lottery ticket sales have topped the 2,000 mark, with just over a fortnight left to take part in the draw. 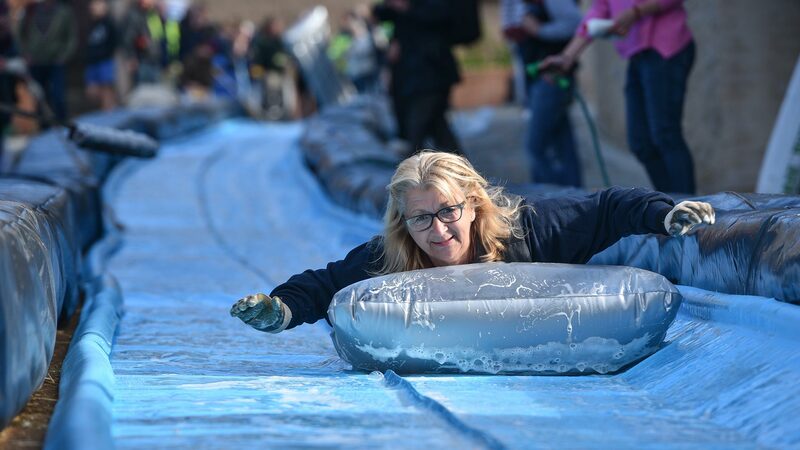 The flume, a 110-yard long waterslide down Flaxengate, will be staged on Sunday, July 12 by the Rotary Club of Lincoln Colonia, alongside their charity partner, the learning disability charity, Linkage Community Trust. With more than 2,100 thrill-seekers having entered the lottery, the event has already generated at least £6,000 in profit for the charity. The £3 online lottery tickets will be on sale until 5pm on Saturday, June 27 with the draw being made the following day. Ten businesses have already signed up for a £250 package in return for five guaranteed places on the flume, meaning the cost of staging the event has been met. Organiser Duncan Gerrard said: “Our extensive testing of the flume suggests that we can accommodate 475 people on the day. The funds raised for Linkage will go towards the charity’s £250,000 Boultham Park Appeal, where an education centre, café and horticulture centre will be developed. The £3.7 million project, a joint venture with City of Lincoln Council, is grant-aided by the Heritage Lottery Fund and Big Lottery Fund Parks for People initiative. Linkage Chief Executive Ges Roulstone added: “Our Lincoln project will provide new facilities for the community, especially local people with learning difficulties. Tickets can be bought from the Lincoln Flume website and the ride will be open from 10am to 5pm. Progress can be followed on Twitter @thelincolnflume and by following the hashtag #zoomtheflume.